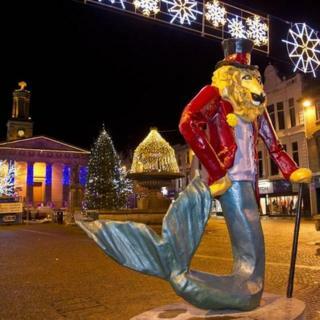 A sculpture of a lion with a fishtail wearing a top hat in a town centre has been branded "cultural vomit". The Dandy Lion by sculptor Vik Quickly was commissioned for Elgin in Moray by the Castle to Cathedral to Cashmere heritage project. However, councillor Sean Morton said it was "cultural and intellectual vomit in technicolor" and called for it to be moved to another location. The artist said everyone was entitled to an opinion. She told the BBC Scotland news website of the reaction: "It does not really bother me - I enjoy the fact people are talking about it. "I read about Elgin and its history - it's not just random." The statue was unveiled earlier this month. Labour's Mr Morton, of Moray Council, said: "I hate it. "I think it should be moved, we cannot just scrap it, this woman worked hard. "Even people who like it do not think it should be there. I think a second opinion is needed. "It does not make sense for it to be in such a prominent position in the heart of our community, near historical landmarks. "I think there are too many ideas in it. It's art, everyone has an opinion." Jim Royan, chairman of the Castle to Cathedral to Cashmere project, said: "There was a public consultation and the response was fantastic. "This is part of a much bigger project and the centre of Elgin will be transformed." Moray Council said it had nothing directly to do with the sculpture as it was commissioned by the heritage project.